We waited in a line that wrapped throughout the bookstore for several hours but we met her last night. 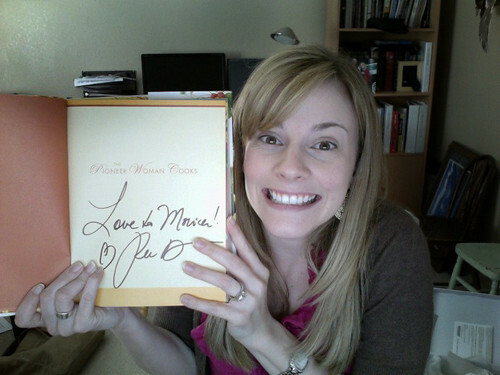 She signed my book. And she was every bit genuine as I'd hoped she would be. 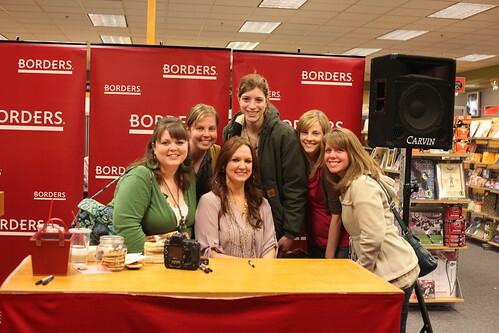 And when I didn't think I could love the pioneer woman any more....I do. She's so adorable and down to earth! awesome! I wish she was coming near me! Hey, I recognize you gals! I'm CA's great aunt-in-law on Caleb's side! I'm more than a little jealous! So exiting! I love P-Dub! She's a fantastic writer and blogger. I'm happy you got to meet her (I'm secretly a little jealous, too)! I knew right when I read the title of your post who you were talking about! She was the first person that came to mind. I don't even have her cookbook yet, but hoping to get it soon! So glad you were able to get Ree's latest book and have her autograph it. I highly doubt she's coming my way. Am gonna order it online soon. I have her cookbook and love it and have used it numerous times. Love your excited face!